When you’re travelling, something you realise very quickly is what is important to take away from every stage of your journey. When all you’re carrying around with you is a 65litre backpack with your whole life compressed into it, that doesn’t leave much space to pick up things along the way. It becomes so much more important to store away all the precious memories from all the places you visit and the things that you see. For me, it’s always been more important to capture the emotions, the colours, smells and tastes of each moment rather than actually having some cheesy souvenir from a market stall. The only real souvenirs I have now are clothes and jewellery I bought along the way, and a dinky little carved elephant from the sanctuary where I volunteered. It seems a poor representation of the incredible 18 months I’ve spent exploring extraordinary countries and the amazing sights I’ve seen. I have nothing physical to link me to the beautiful souls I met along the way, and yet I still feel so inextricably linked to them no matter what the distance, all because of the memories in this little diary. As I said my goodbyes to friends and family before I left to go travelling, there were gifts and cards wishing me well on my journey, but none meant as much as the one from my workmates. They had clubbed together to buy me a few little goodies, including a beautiful little travel journal to take with me and write all my memories as I traveled around the world solo. The red patterned leather book was the perfect place to store every thought, feeling and experience as I set out on my adventure. It was such a thoughtful gift, and one I treasured as I traveled across Asia and Australia, writing in it became a nightly treat as I reminisced over the day’s events. I’m a traditionalist when it comes to the delights of reading actual books instead of screens and hand writing notes, there’s something so beautiful about actually holding something in your hand rather than sending an email or downloading an e-book. I love blogging, it has been a huge part of my travelling experience and I would heartily recommend any traveler keep a blog so they have an easily accessible journal to store their memories and photographs that they can share with the world. Doing so has meant sharing every beautiful experience with friends, family and countless strangers through the internet, it’s been amazing to know I could help other travelers by advising them on locations I had already visited. 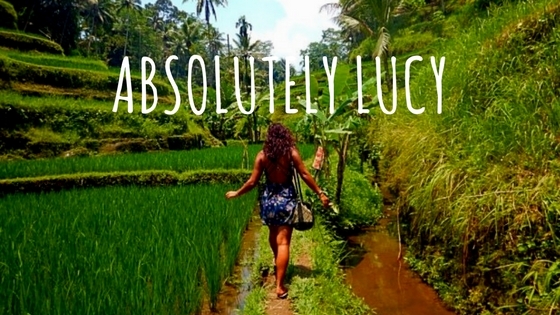 But, as amazing as blogging is, there is still a lot of my world and my heart that I don’t share on www.absolutelylucy.com. For my own sanity and privacy, it is important to me to have a part of my life that is separate, and that part is even more special to me. That’s the part that is hidden in the pages of my travel journal, of the book that is just for me, filled with tales of love, hopes and dreams, of the experiences that are etched on my soul and the stories I simply cannot repeat. Whether you’re a writer, an artist or a musician, creative souls have a need to express their big ideas and as a traveler, the exposure to so many amazing places and people is the perfect driving force for putting pen to paper. For me, writing was addictive when I was away, I just couldn’t write fast enough to get all my thoughts out. Some people struggle to spend time alone, but I can’t help wondering if that is actually because they don’t have a satisfying way of expressing themselves when they do. I craved time alone to write both in my travel journal, and on here, it was therapeutic and even writing the tiniest details would often work as a catalyst for creating the posts that you ended up reading. It was amazing how much one would influence the other, often I would start writing in my journal, then halfway through I would have to grab my laptop and start typing a new blog post to share with you guys. Travel is inspiration in its purest form. After working as a journalist, it was so freeing to be able to spend my days and nights writing purely for myself, the more I wrote, the more the words flowed on to the pages. It’s addictive. Even as the moments were happening, I was experiencing them as I would write them on the page, always thinking of how I would immortalise every person I met as though they were a character in a story I was writing. I loved that feeling, and I feel lucky to have experienced a world that excited me enough to write like this. But whether you write for a living or you just want to keep a momento of your travels, keeping a travel diary is such beautiful way of storing your memories and keeping them close to your heart when you move on. You just don’t get the same experience when you clutch your laptop close to you as you remember those you left behind, but there’s something comforting about having a little book that is just for you. It doesn’t have to be words, I knew so many travelers who incorporated music, art and poetry into their own books, each inspired in different ways to create something, a memory of each stage of their journey. I’ll always remember a friend, Phoebe, who I met in Pai, Thailand, who had started holding “art club” with new friends as she traveled around. She was a beautiful soul who traveled with a tiny collection of paints, pens and gathered a group around to create something amazing together in the pages of her little journal. This way everyone had to contribute something and years later she would look at it and remember every single person who was there. When I was on the slow boat between Thailand and Laos, there was a woman who used her artistic skills to capture each moment – she actually started to sketch and paint the scene in front of her as a group of us played games and chatted. Her work was beautiful and it was incredible to see the finished piece against the live scene, our trip is now captured forever and it’s all thanks to her amazing talents. Another friend of mine wrote a mixture of poems and prose inspired by the place he was in, he loved to read aloud to us in the evenings and share the words he felt compelled to write. And I’ll never forget the guy I met who said art and words were not his forte but said each place had a song, a sound that was distinctive, he spent his time trying to capture the essence of each location in music, in lyrics he created. The results were beautiful. I still have my travel journal from my first 18 months of travelling, it sits proudly on my shelf which I’m surprised doesn’t bow under the weight of all those memories. With just a few months at home and a few trips around Europe planned, my thoughts are already on preparing for my return to Australia as I sort out visas, tax returns and insurance. But something that had slipped my mind until the team at Pen Heaven sent me a beautiful hand made leather travel journal by Laurige to be my “trusty companion to help with all my creative thoughts, memos and notes.” Made by French artisans, my journal arrived in a stunning deep red, with Absolutely Lucy embossed in gold lettering on the bottom right corner. It was the ultimate in luxury for a writer, and gives me the perfect place to keep track of every precious travelling moment. The journal makes the perfect gift for a traveler, because no traveler wants something they cannot take with them – what’s the point in leaving things locked up in storage? This is something personal that they will treasure forever, even more so because the leather case is refillable – you can replace the writing paper within as it runs out and start afresh for each voyage. At £47 it is a little pricey for a journal, but as a gift that will never grow old, it is perfect for any adventurers in your life, a timeless keepsake they will treasure forever, and a perfect place to store their big ideas. It’s available in a range of gorgeous colours and you can choose whether you prefer lined paper for writing, or fancy getting creative with plain paper. I’ll be using mine to write all those beautiful memories, and to make big plans for the future. Find the full range of Laurige products here to order your personalised travel journal. Have you kept a travel journal – what does yours mean to you? How do you keep track of your memories? Do you regret not keeping a journal? Ah I love this! I’m a huge journal person! I would travel just to keep a journal while there.